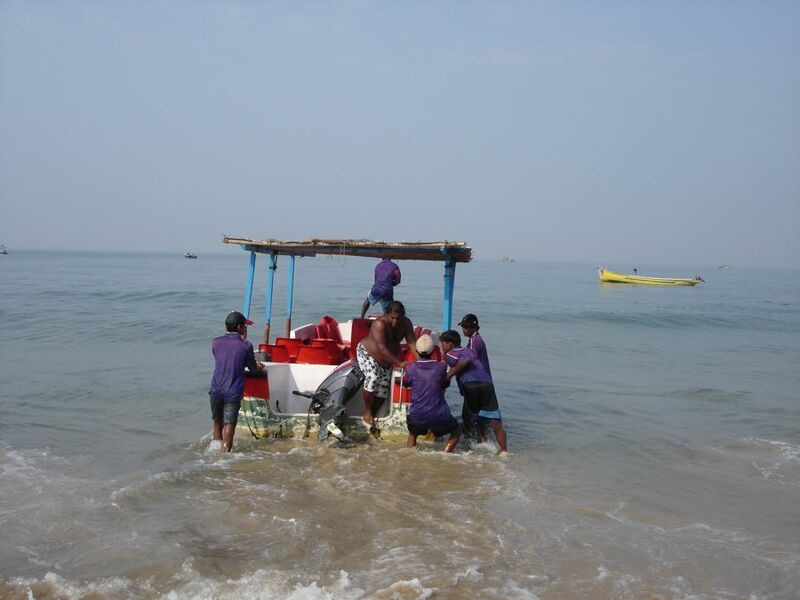 The weekend trip I took to Goa in February 2005 was very different from any other trips I had taken. First, because I went with three other people I had only met once! 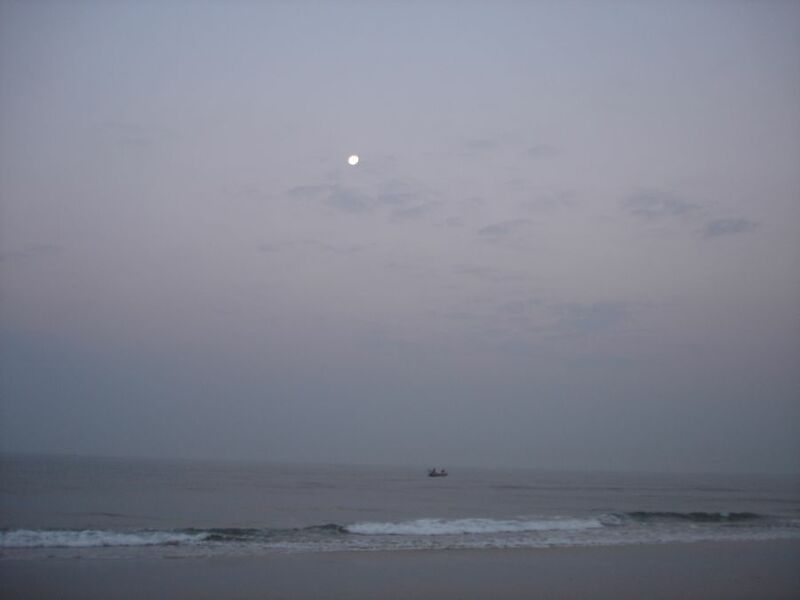 And second, because we stayed in North Goa. I usually prefer the South because the beaches are much more beautiful and secluded there. But then North Goa is more “happening” and my friends and I really wanted to check out the nightlife. We reached Mapusa at seven on a Friday morning and decided to sink anchor at Baga. No trouble getting a cab, and a little later, with the help of (or despite) my broken Konkani, we managed to find comfortable lodgings at the Sea View Resort at Baga beach. 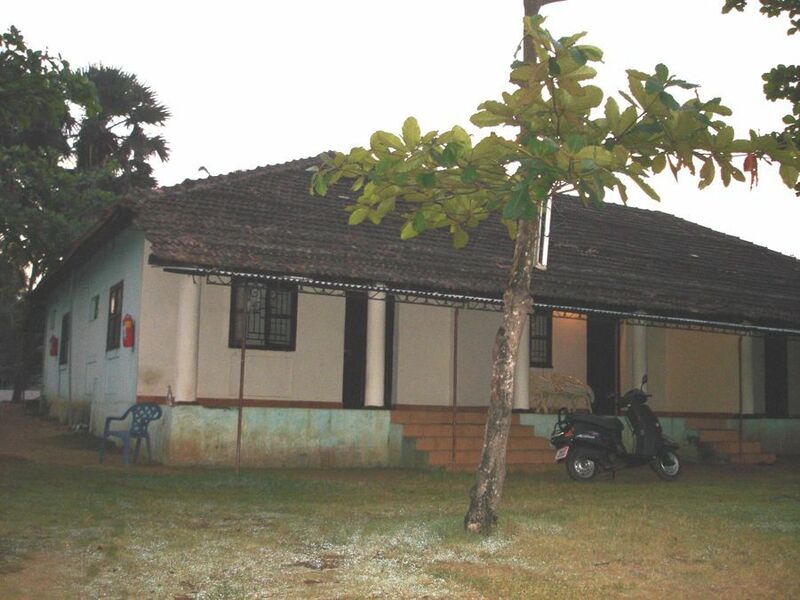 Although our Baga Beach accommodation cost a little more than we’d planned to pay, the place was very cosy. The high ceilings and tiled roof felt just like an old Goan home, and our rooms were a stone’s throw away from the beach. After dumping our backpacks in the room, my friends and I headed down to the shack in front of the resort for breakfast. 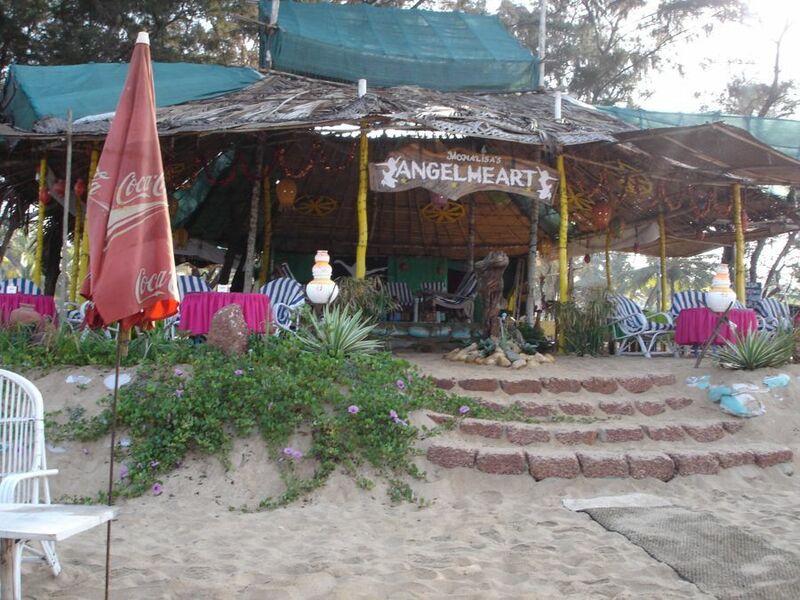 Intriguingly called Monalisa’s Angelheart, the name and logo were about the only things that distinguished it from the multitude of little shacks that dotted the beach. 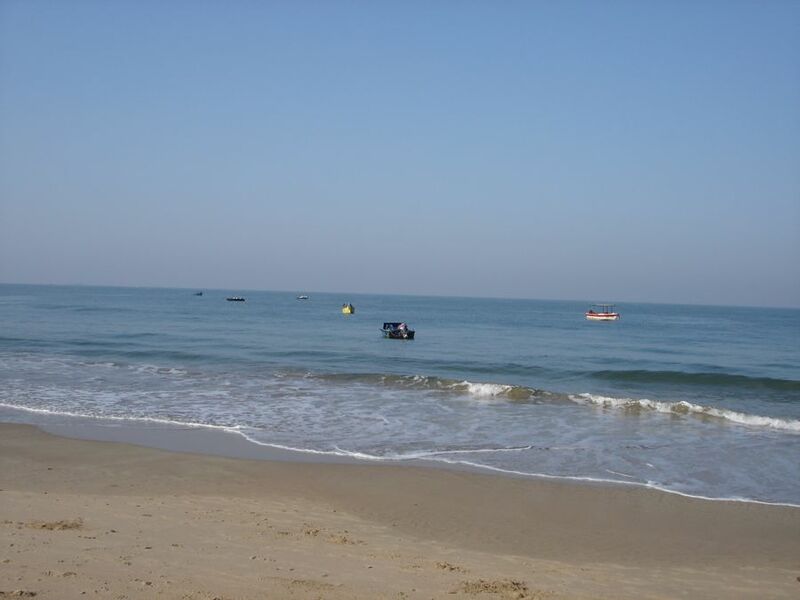 The beaches of North Goa – except for Baga, Candolim and Sinquerim, are really not my preferred destination for a Goan holiday. 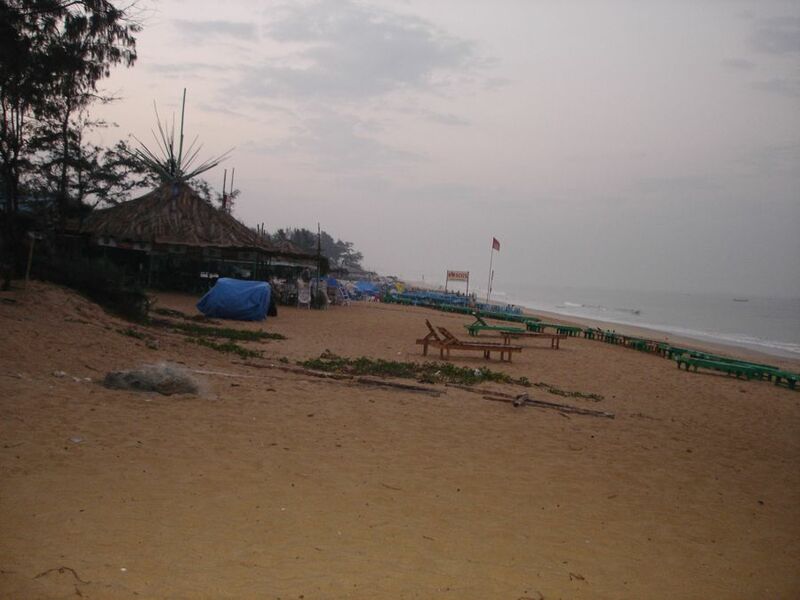 Most of North Goa is lined with rocky beaches like Anjuna and Vagator that are better known for parties and drugs, than for their white sands. My German friends, Patrick and Wiebke were backpackers and the sort of folks who were completely open to new cultures and experiences. So much that they were not even averse to travelling in the overcrowded second-class compartment of a Mumbai local train at peak hour. Now that’s an adventure by any standards! I found them so different from the tourists whose only experience of India is restricted to the rarefied air of their five-star hotel and air-conditioned transport. On our first afternoon in Baga, they decided to take in a little sun on one of the recliners in front of the shacks. Since I prefer to avoid the sun, I contented myself with slapping on the SPF45 and relaxing in the shade of Monalisa’s Angelheart. Back then I lived in Mumbai. Life there was so crazy that it actually took me a while to wind down. It was weird at first because I kept thinking that I had something to do or somewhere to go. It was only after a while that it hit me that I had nothing to do but eat, have a cold beer, lie on the beach and sleep. Ooooh, heaven! It’s not surprising that Goa has spawned more poets, writers and musicians than professionals and businessmen. There’s probably something about the sea air, the atmosphere, the languid pace of life, that brings out the creative side in its inhabitants. One of my favourite things to do in Goa is to pig out on seafood. I mean, nowhere in Mumbai can you get such fresh, delicious mussels fried in rawa or semolina (yum!) squid and pomfret? To me, the seafood in Mumbai reeks of lead, cadmium, mercury and all the foul stuff that the industries there pour into the sea (not to mention the untreated sewage, yuck). But in Goa, the fish always tastes fresh and delicious. I got Patrick (the only other person in our group to eat meat) to try out the Chicken Xacuti, which he claimed was “perfect.” It’s hard being a vegetarian in Goa. After a few hours in the sun, Patrick and Wiebke were good and roasted. Patrick actually got sunburnt, poor guy. We were too tired from our bus journey to check out the party scene, so we went for a walk down the beach late in the evening and stopped off at a beach restaurant called Drop Anchor. The restaurant was built at a height of about 10 or more feet above the beach. The décor there was a perplexing mix of low sofas in North Indian style and curtains with an Oriental motif. We were offered a hookah but declined. The tide was coming up as we walked back to our little rooms after dinner. We sat on the beach for a while enjoying the cool sand beneath our feet, till a rather large wave nearly wiped us out and had us rolling with laughter at our encounter with a “mini-tsunami”. I woke up when it was still dark and early the next morning – an unusual occurrence for me since I’m not a morning person. I got out my camera and decided to go for a walk on the beach and take photos. It was a cool, pleasant morning with none of the chill of winter. I enjoyed exploring the beach in the early morning light. The sun was just rising above the coconut trees while the moon still hung like a lantern over the fishing boats. I walked around taking photos on the beach, watching the fishermen take their boats out to sea and making friends with a little doggie who took a shine to me. This little guy took a shine to me. It was love at first sight for us both. 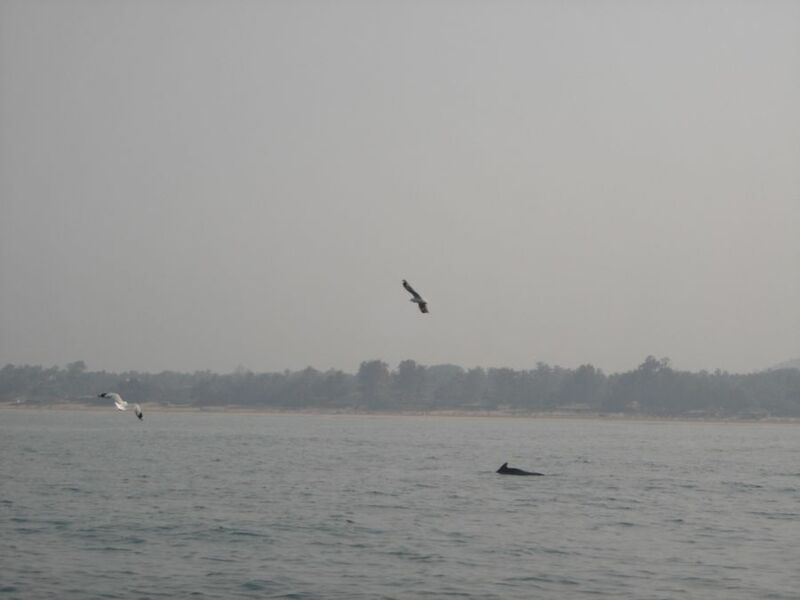 When the others woke, Wiebke and I decided to go for a dolphin-watching trip. We saw a few fins, but this was the closest we got to the dolphins. It was fun, though. 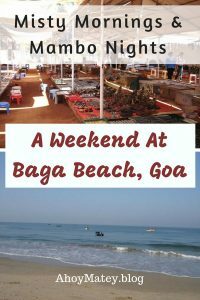 Over the next couple of days, we explored Baga, the flea markets and the party scene at Tito’s Café Mambo, an open-air disco and bar, where we saw creepy Indian men trying to dance with any gora women who would give them the chance. After a few drinks and laughs at Café Mambo, we retired to our rooms for the night. 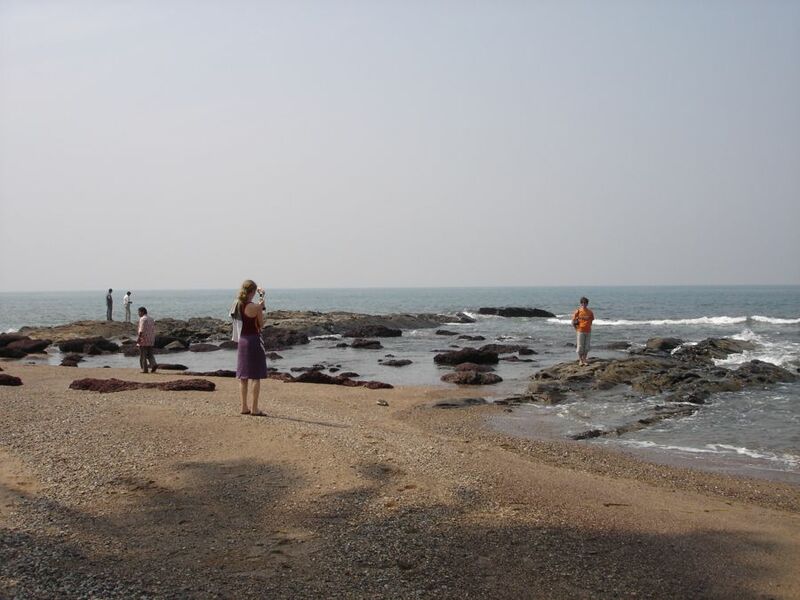 The next day, we hired a beat-up old Fiat and drove to Anjuna beach where we hung out on the rocks for a while. 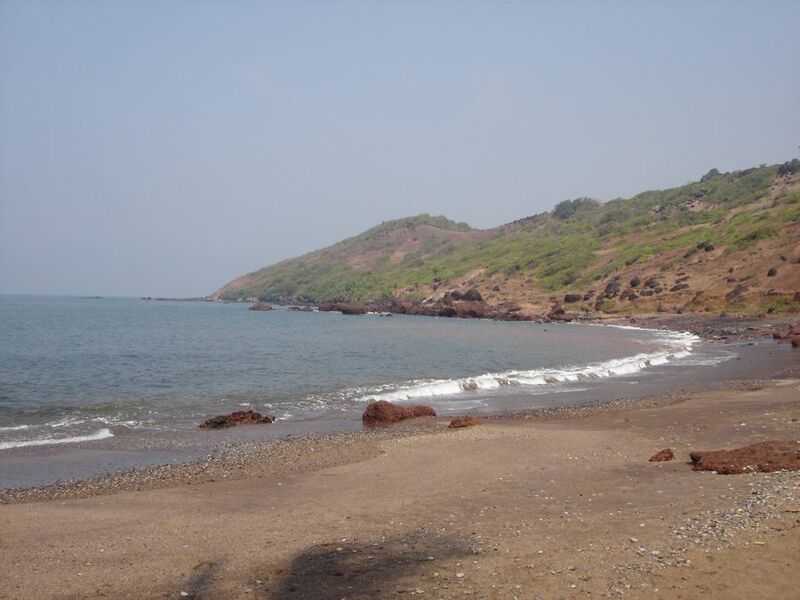 Anjuna was where the infamous and sad case of 15-years old Scarlett Keeling unfolded in 2008. This beach is notorious for its party and drug scene. 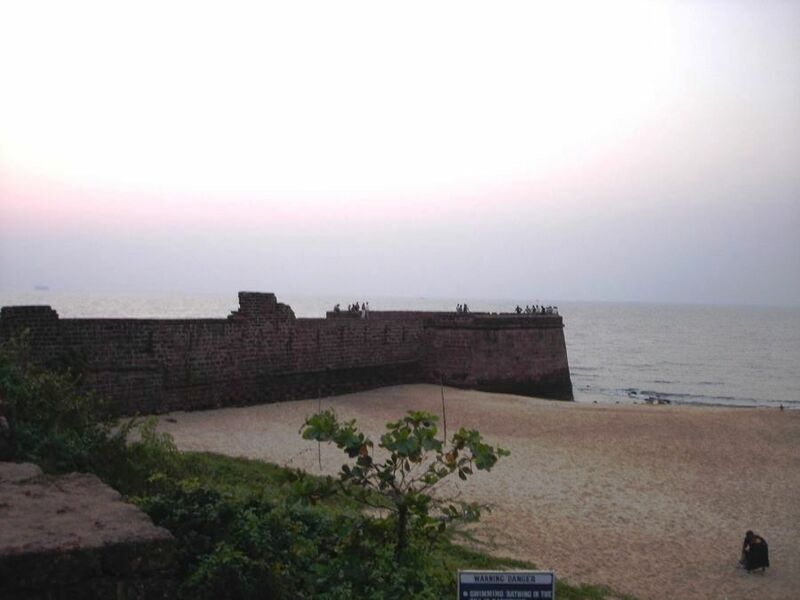 Then we drove through Candolim, checked out a few of the fake antique furniture stores and went on to Sinquerim beach, which adjoins the Aguada Fort. On our last day, before we caught our bus from the Mapusa bus stand, Patrick, Wiebke and I went for a delicious Goan lunch in a restaurant nearby where Patrick regaled me with hilarious stories of their trip to Cambodia. By this time I was missing my family immensely. They were all I could think about. As a mom, it’s hard to take time away from your child and family, and this was the first trip I took with friends a few years after my child was born. It was also the first time I had been away from my child for so many days, and the pangs of guilt were getting to me. I desperately wanted to go home as soon as possible. The weekend in Baga was a welcome respite, no doubt, but by the end of it, I was glad to be home and hold my baby in my arms again. Eating fresh seafood, going for early morning sunrise walks along the beach and playing with the stray dogs, sitting at a beach shack and sipping on cocktails is my favourite thing to do in Goa as well. I’ve been to Goa several times actually, once was with friends from college, right before we graduated, another time was when I was living in Mumbai, and a couple of times after. 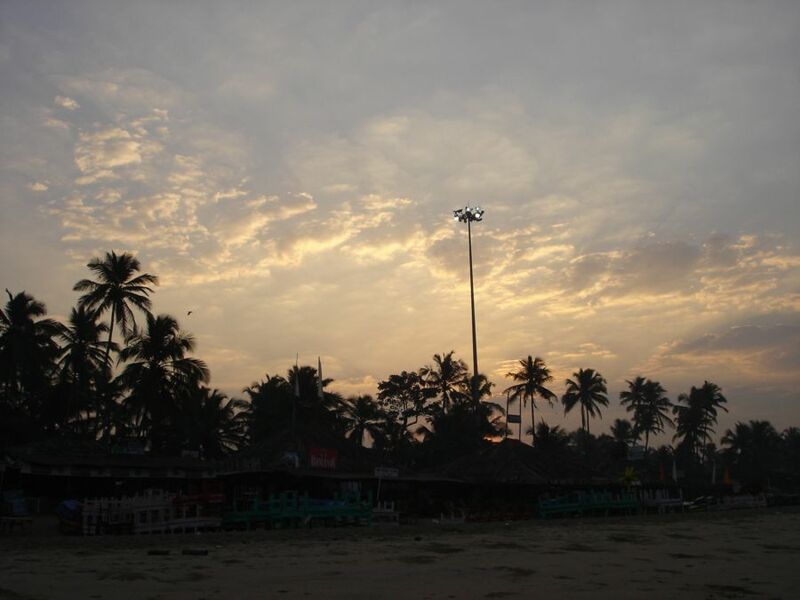 You’re right, there is something about Goa’s air! And the seafood for sure is a hundred times better than what you get in Mumbai! So right, Medha. The seafood is so yummy in Goa. However, I’ve been told to avoid eating seafood in Goa (or anywhere along our coast) in the monsoon because it’s not fresh and has to be imported. Actually, we didn’t go anywhere near the drugs and the only party we saw was at Cafe Mambo. I’m quite chicken and prefer it that way. India is pretty high on my bucket list, and of course, I would not like to miss Goa. I’d also like to know whether there are still traces of the Portuguese…invasion (besides people’s last names). Definitely an interesting place to visit. Well, my maiden surname was Desouza, so yes there are plenty of reminders of the Portuguese in Goa, including refurbished Portuguese villas that are let out to guests. Also, Konkani (the official language) has many Portuguese words thrown in. Many families still speak Portuguese at home, too. Goa is such an amazing place! I was there a few years ago and did some parasailing. Didn’t do any mambo though, I’ll have to go back! Mambo is the name of the nightclub in Baga. There is no mambo dancing happening there. You had me at fresh seafood, and meat dishes, give me a sandy beach, a nice cool breeze and the sea and I will be a happy camper, if there is a possibility to see dolphins even better. I really like the pictures of the beaches, they all look lovely, it looks like a good weekend getaway. Probably going to put India on my list of places to visit. I hope you can make it, Matija. You would love it. 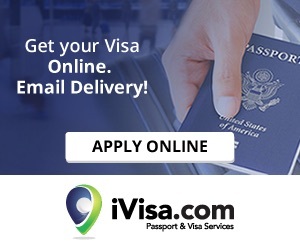 Of all the places I’d like to see if I visit India, it’s Goa. Your photos of the beaches are quite romantic, and I wish I had a dog so I could take them with me to the beach! Hope I get to visit one day! 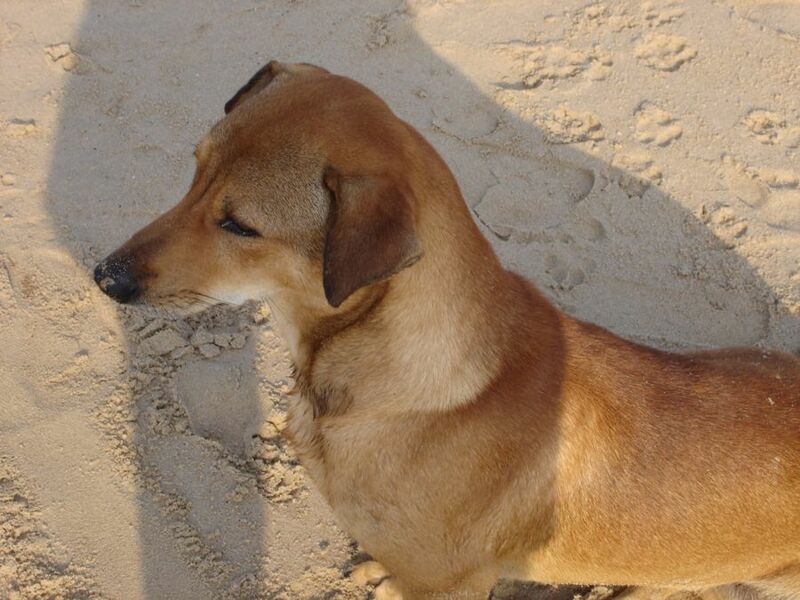 You’re very likely to meet a dog on the beach and fall in love with it. 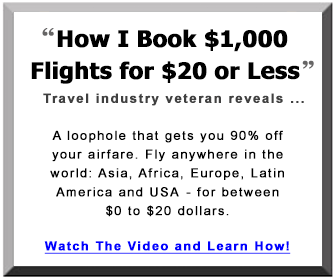 Lots of foreigners do and end up shipping them back home with them. 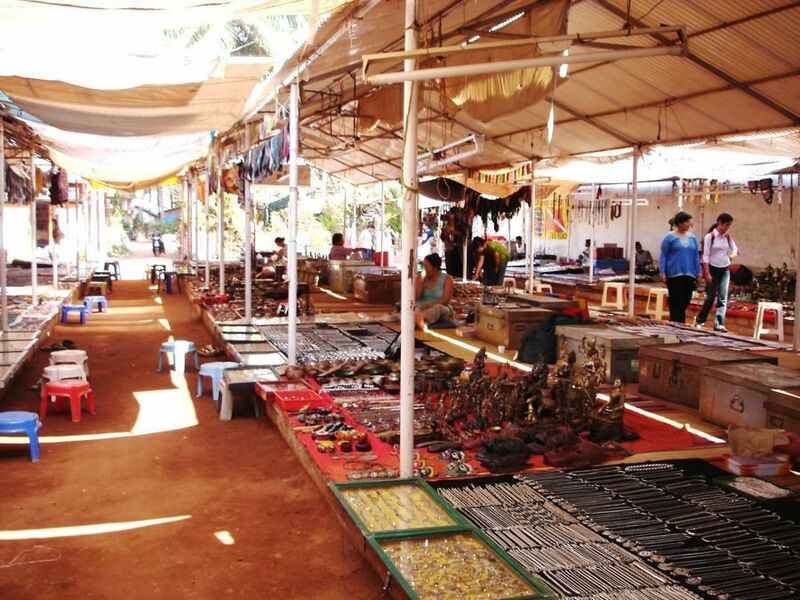 I think the last time I saw Goa photos, they were full of people having a party. 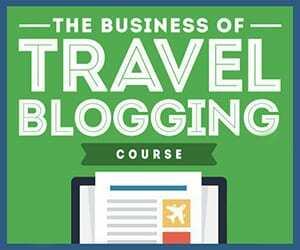 You travel bloggers convince me that Goa is something more. In Russia, it has a reputation of party place. 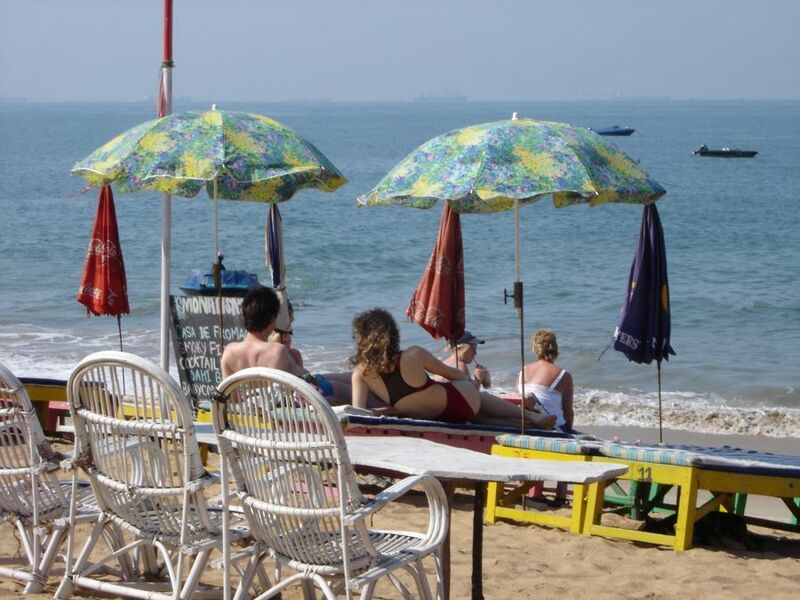 Alexander, Goa has something for everyone, partygoers or people who love peace and quiet. It all depends on what you’re looking for. This was in 2005 when I would still enjoy a party. I no longer look for that now. Goa is amazing and I will visit it soon. This place seems to have the relax mode on. 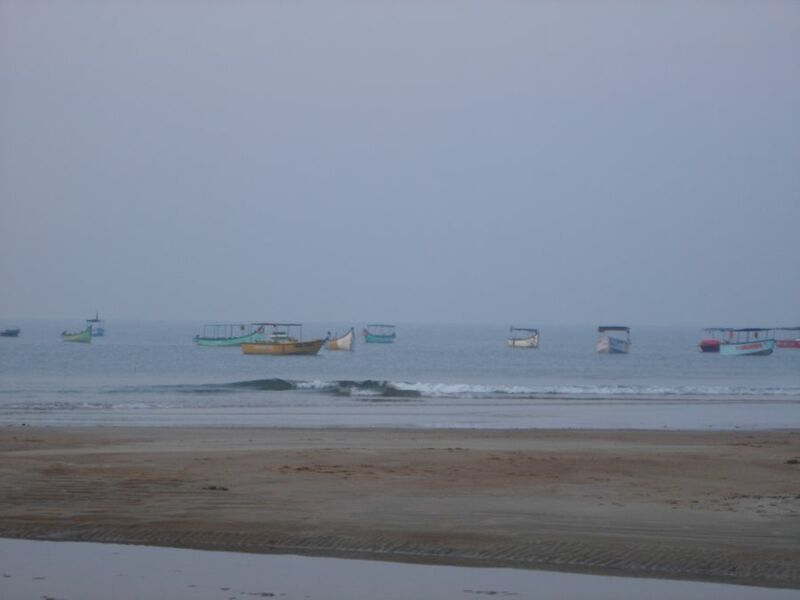 A couple of my friends are visiting Goa and they have Baga Beach in their itinerary. Though the resort looks a bit non-resort-y from outside, good to know that it was cozy and had an old goan home feel to it. All the way from Germany to travel by Mumbai local??? Whoa! That’s one helluva contrast! Avoid Baga and Calangute like the plague. They are next to a bus terminal from which low class domestic tourists arrive from out of state. Many of them are ‘tharki’ (pervert) types who go wild at the sight of women in bikinis, especially white ones. They gather around sunbathing female western tourists, leer and then and point their phone cameras at them. Quite shameful stuff that made me ashamed to be an Indian. Absolutely agree with you, Dev. Read my other articles on Goa. They talk about the same issues you do. I stick to South Goa beaches nowadays and can only hope the tourist hordes leave them alone.